I’m a huge fan of gourmet sugar cookies. But I’m not a huge fan of accumulating a bunch of cookie cutters that I have to store somewhere when not in use. So, I decided to whip up some holiday sugar cookies and surf Pinterest for a few decorating ideas. Wowza, it’s amazing what is out there. Some pretty creative bakers in the Pinterest world. For this recipe I used a 3″ square cookie cutter. In the picture are just three examples of decorating ideas that we used for these cookies. These were all decorated with royal icing but many times you can buy Wilton decorating kits that will have a few of the needed accessories, like eyes or belt buckles. You get the idea. Or just go with sanding sugar to sprinkle on top. Doesn’t get any easier than that. We used the same royal icing recipe as we used for the Halloween cookies. No change just different colors. For the Santa belt buckle we used the Wilton kit. We then frosted the belt buckle and dipped it in sprinkles. The original color was yellow and that just didn’t seem to be the color we were going for. And besides who doesn’t love a little sparkle on their belt buckle. If you didn’t want to go through the effort of decorating you could just sprinkle some sanding sugar on before baking and call it done. The recipe makes two dozen cookies. You could cut it in half if you only wanted one dozen. It’s a simple recipe. A few ingredients and nothing fancy. Beat butter and sugar in stand mixer. Stir in the dry ingredients. Not much to it. When you first make the dough, it will be sticky and not very manageable. You are going to need to chill it for a few hours before rolling it out. The flavor of these is just delicious and worth the wait. They are soft and delicate. I stored them in an airtight container for a week after and continued to enjoy fresh cookies that entire time. It’s important to not overcook sugar cookies. When the edges start (and by start, I mean barely light golden brown) to get brown you are done. With all that said, you have the perfect base for frosting, sprinkles or other decorations. When cutting out your cookies you want to keep the cuts as close as possible to avoid wasting any dough. You will reroll the scraps but then you must flour the surface again. Which is now adding too much flour to your cookies. For thinner, crispier cookies roll the dough to an 1/8 of an inch. And the edges will become golden brown. For thicker softer cookies (which are my favorite way to have this recipe) roll the dough to a 1/4 of an inch. Watch for the cookies to just begin turning lightly golden brown at the edges and remove from the oven. Cool on the pan. They will break if you try to move them too early. I hope you enjoy these as much as we do. Please share if you end up making them. We always love to hear how it turns out. Happy holidays! In the bowl of a stand mixer with the paddle attachment, beat the sugar and butter until pale and fluffy. Add the eggs and vanilla and continue to mix until incorporated. In a separate bowl stir together AP flour, baking powder and salt. Add the dry mix into the mixer bowl and hand stir until incorporated. Lay out a large piece of plastic wrap and put 1/2 of the dough onto the wrap. Cover with plastic wrap and mold into a disk. Do the same with the other half of the dough. Once dough has finished chilling, heat oven to 350°F. Generously dust a clean surface with flour and roll the dough out to 1/4 inch. Use a cookie cutter to cut out shapes and a spatula to transfer them to the baking sheet. Bake at 350° for 7-10 minutes or until edges begin to turn lightly golden brown. What a great idea! I have a giant container of cookie cutters and I can almost never find the one I am looking for lol. Keeping it simple with the same shape but different decorations is so smart! I’m right there with you with having too many and can’t ever find the one I want. I love these, they are so cute and so festive! The perfect holiday sugar cookies – seems almost a shame to bite into them but of course I would, delicious! These are adorable! Sugar cookies are such a perfect part of Christmas and I love the way you’ve decorated them, so fun! What beautiful cookies! Your tips are helpful. I agree, I like thicker, softer cookies too. I wish I was half as talented! Sugar cookies the perfect Christmas treat. They are one of our favorites and a tradition to make and decorate. Such a delish way to celebrate the holidays. One of my favorite holiday traditions. Christmas can’t come without having made a batch of sugar cookies. We love decorating them with fun colors and sprinkles. It’s such a tradition for us also. Wouldn’t be Christmas without them. These cookies are beautiful. I love the idea of keeping them the same shape and yet decorating them differently. It’s such a great idea. My cookie cutters are never where I want them to be when I’m looking for them. I will definitely be doing this next year. Sugar cookies are the holidays! These look so easy to make, which will make baking them together much more enjoyable. Those are the absolute cutest cookies. I love how with each cookie, you just see part of the picture. Like just the belt or just the snowman face. They would make such a great cookie display. Thanks so much 🙂 We had such a fun time with these cookies. These are so adorable! I love them! I’ll have to make some with the kiddos! It would be awesome not to have to deal with a lot of cookie cutters, they take up too much space when you have too many. I think this is a brilliant idea and I really love how you decorated the cookies! Pinterest is a life saver. Thanks so much! You are right about all those cutters taking up way too much space! These cookies are so cute. 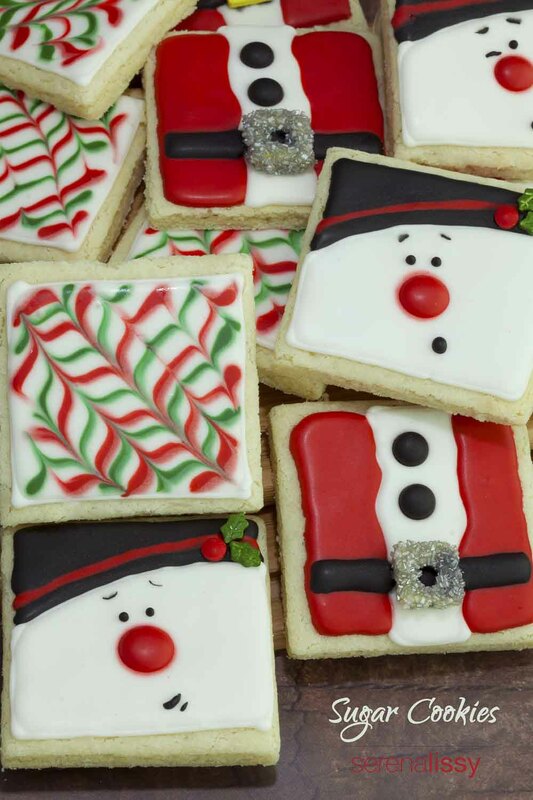 I love the idea of doing a square sugar cookie and the creating little works of art on them. It’s almost like looking at a painting, only you get to eat these tasty treats instead of just gazing at them. Those are adorable!!! I wish I had the talent to decorate that. A big downside of sugar cookies for me is all of the cookie cutters. I like the idea of decorating the squares. It works for any season. I love simple recipes. I don’t like to have extra of random ingredients laying around that rarely get used so these are perfect! I love that they can be decorated for any Holiday as well! These cookies look amazing. My little ones would love having these. Oh my goodness! These are way too cute! What a fantastic and fun idea! We are making cookies this weekend we should try these! These cookies are beautiful and I’d love to make them this weekend! We’re baking Christmas Eve evening for Santa. we just made sugar cookies last night! 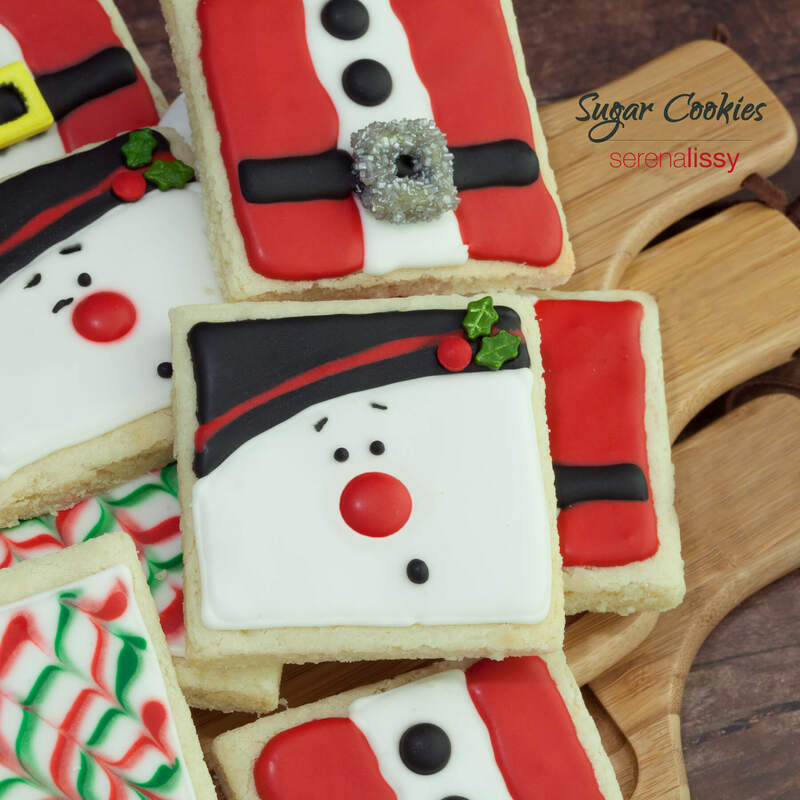 sugar cookies just scream Christmas! I make so many baked goods during the holidays but one I never make are frosted sugar cookies because I’ve never had a good recipe. Thanks for sharing I’m going to make these with my boys tonight.